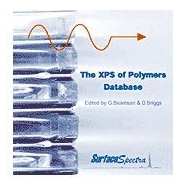 SurfaceSpectra provides a knowledge system to support practical analysis mainly by way of a static SIMS database and polymer XPS spectrum database. "High Resolution XPS of Organic Polymers: The Scienta ESCA 300 Database", Wiley 1992 is an out-of-print manual which is a high-quality polymer XPS database edited by Graham Beamson and David Briggs and that has been brought back in an electronic and user-friendly version. The CD-ROM contains all the XPS spectral data (list of spectra, curve fitted data, assignment, and binding energy) re-recorded and acquired from the 111 polymers which and contained in Adobe Acrobat format in this book along with original electronic data in PHI MultiPak format, VAMAS (ISO 14976) and ASCII format.